I don’t consider myself any different from a person who started using drugs at an early age from my personal experience of addiction. All addicts share the same story and shame. We just have all arrived at the same place under different circumstances. I was considered a good Catholic girl who never used drugs or hung around the “wrong” crowd. I believe that playing soccer in college prevented me from becoming an addict sooner. I always had that addictive personality, so I thought I was safe once I was in the real world, then having 3 boys. I was the stereotypical soccer mom, had the mini-van & was always taking my boys to the park, the zoo, the library; anywhere that I felt my boys would have a fun time. Right after I had my youngest son, Teddy, my whole world came crashing down on me in one moment, in one pain pill. For some reason, I was unable to breastfeed my boys. We hired nurses to come to the house to help me & they just wouldn’t latch on. I felt like a failure as a mom, as silly as that may seem for others, it was a devastation to me and my “soccer mom” persona I once had! I was given a month’s supply of percocets for the pain of breastfeeding & all of a sudden, I felt good in my own skin, I felt like the best mom again. Instead of every 3 hours of anxiety & tears, those pills made me feel adequate, happy, and even serene. I knew at that exact moment at 4 am in 2005, that I became an addict. I could never understand why, I had numerous surgeries from age 14-21 from sports injuries and the pain pills never gave me a good feeling, I guess during that time, my addicted brain wasn’t ready for me yet. That monster waited until I had a 4 year old, 2 year, & a newborn to completely grab a hold of me. I hid my addiction to pills for over a year. I was ashamed of how sneaky I became. I was ashamed that I couldn’t stop, even for my little boys. I went to a 30 day rehab which almost destroyed what little love I had of myself, because I had to leave my 3 young sons with my parents and brothers. I was clean for a good stretch, then found an old stash of pills in my closet & boom I was right back where I was before. I was too embarrassed and ashamed to tell my parents that their daughter failed again, so I thought the Methadone Clinic was my answer. I was going back to school to become an RN in hopes to work for a treatment center, but with the stress of school, my divorce, and my 3 boys, I was convinced that methadone was what would keep me “sober”. I had no idea that the clinic would prescribe me a drug that is highly addictive and would have a hold over me, nor was I ever told that this horrible drug is almost impossible to kick. I all of a sudden became depressed, over-weight, my skin even looked horrible. My brain was always in a fog. I could never get enough sleep & felt like I was in a deep hole that I would never get out of again. I didn’t realize, nor was told by the nurses at the clinic that it takes at least a year to wean off methadone. And, even so, it would stay in my system for many months & would have withdrawals for many months. I had enough of it all. I wasn’t the same energetic mom, friend, sister, aunt, or daughter. After doing research on the drug on the internet, I found Rapid Drug Detox! After finally admitting to my family that I was on methadone & showed them all the research about it, all of a sudden a light bulb went off in their heads! They couldn’t understand why I was so sad, lethargic, and when I did smile, there was no light inside my eyes. I went in the next week, not knowing what would happen, all I knew was that I was desperate to be free of this poison. Every single person, from the receptionist, the RN’s, medics, & Dr’s were wonderful. It felt great knowing that they could help flush this out of my system! At the hotel, no matter what time of the night it was, when my brother called, they came at once if we needed them. I still have to call Jeanne with questions & she is a saint! Just because your procedure is complete, doesn’t mean you are no longer under their guidance. For the first time in over 1 1/2 yrs, my old self is back. I’m popping out of bed with a smile & having a blast with my boys again. My 3 brothers couldn’t believe how wonderful I looked again, my skin is back to normal, my energy is back & I am already losing weight. I don’t have any illusions that my recovery is over, it as only begun. It’s been 3 weeks since my detox & every day is a gift to me. I am back to my 12 step program with a sponsor and there are days I do need 2 meetings, but that beats going to a place like the clinic where they don’t make money when you recover, they want you trapped! My self-confidence is back, by words of family and friends saying how my up-beat personality is back & that they are seeing the old Amy back! I honestly believe that if I hadn’t tried this procedure, my depression and shame would have taken me to a darker place. I highly encourage anyone who is addicted to methadone that this is the place for you. Or any drug for that matter, this is the place for you. I have never written a testimonial before, because there wasn’t anything out there that I felt so strongly about before I walked through those doors. 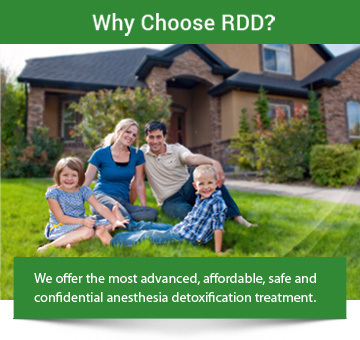 You will be well taken care of by the staff at Rapid Detox, their experience speaks for itself!